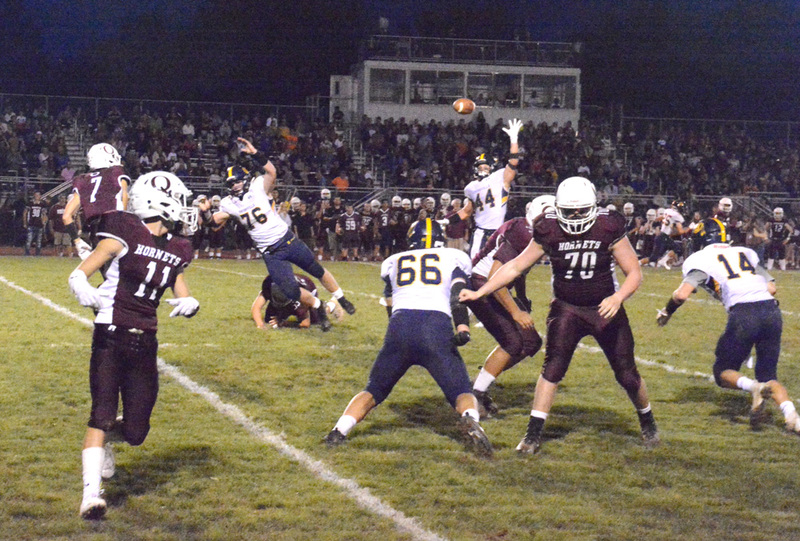 Unionville’s Alex Pelegrin leaps to block a pass by Oxford quarterback Brett Kochmansky. OXFORD — It’s a terrible cliche (or meme, or joke in a TV commercial) but, in football, defense really does win championships — and it certainly won a game Friday night. And while it might have been tempting to focus on Unionville’s offense on a big scoring night, a deeper dive might show it was a ferocious and swarming defense from the opening minutes that really doomed a much improved Oxford, Friday night, as the Indians posted an impressive 48-12 win over the Hornets in a Ches Mont American matchup. For Unionville (2-3, 2-0), to be sure, the offense had a second straight solid night — but the burden is easier when your defense keeps giving you the ball back at midfield, which was the rule rather than the exception. Unionville’s Nick Schnaars races for a big gain. On the Hornets’ (3-2, 0-1) first three possessions of the game, the Indians’ defense just physically battered them, forcing three straight three-and-outs — giving Unionville the ball on the Oxford 49, Oxford 42 and finally, the Oxford 16. All three times, thee offense cashed in quickly and Oxford’s hopes were pretty much crushed. Then a Jeffrey Lang 58-yard touchdown interception on the fourth possession all but put the game out of reach early in the second quarter. A fifth quick stop gave the Indians the ball on the Oxford 42, but the ensuing drive stalled at the Oxford 14. The 27-0 halftime lead was a product of exceptional defensive play by Unionville, by a unit that seems to be improving with each week. 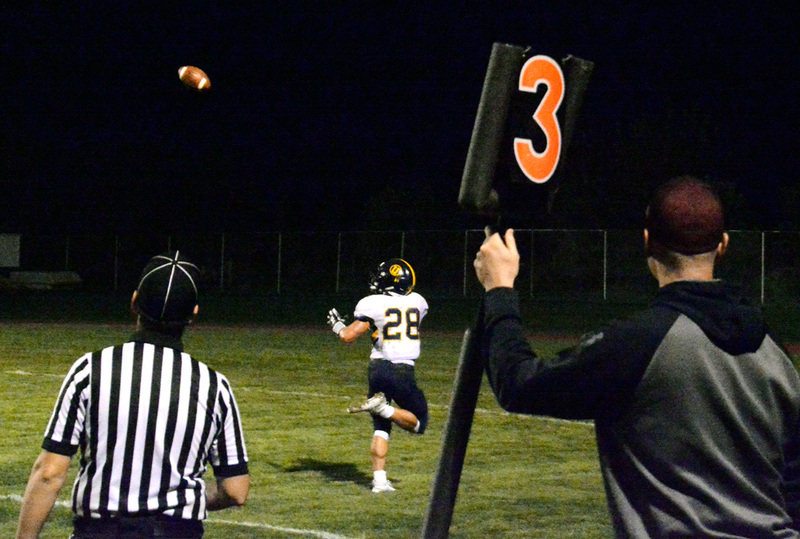 A wide open Connor Schilling hauls in a TD pass for Unionville. Even with the slow start for Unionville, its defense started to show signs of being another elite unit, led in part by senior Pelegrin. In the last two games, last week against Great Valley and Friday at Oxford, that defense, and Pelegrin seemed to find a higher gear. Aside from being in on a ton of tackles, Pelegrin managed to snag a pass out of midair for a pick, and constantly tormented Oxford’s quarterbacks and running backs. For his part, Pelegrin deflected credit and said it was a matter of the whole defense coming together and playing as one. Which was evident right from the start, Friday night. Unionville’s Sam Schriver closes in on Oxford QB Brett Kochmansky. On those first three short field possessions, Connor Schilling scored from 1-yard out to give Unionville a 6-0 lead (a Dominic Braithwaite extra point attempt was blocked). Then, Schilling scored again, this time with an impressive 25-yard run to make it 13-0 late in the first quarter. Finally, QB Blake Charlton hit Schilling with a 7-yard pass, which made it 20-0 with Braithwaite’s extra point. After Lang’s grab and dash down the left sideline, Braithwaite hit another point after to make it 27-0 early in the second quarter. The Hornets finally mounted a drive in the final minutes of half, but bogged down around the Unionville 40 as time expired on the half. Although Oxford came out with much higher intensity to start the second half, it could only play Unionville to a draw, for the most part. The Hornets did manage to get on the scoreboard midway through the quarter when QB Brett Kochmansky hit Brandon McWilliams on a gorgeous 58 yard pass, setting up Kochmansky’s 2-yard TD run. A missed two-point conversion left the score 27-6. 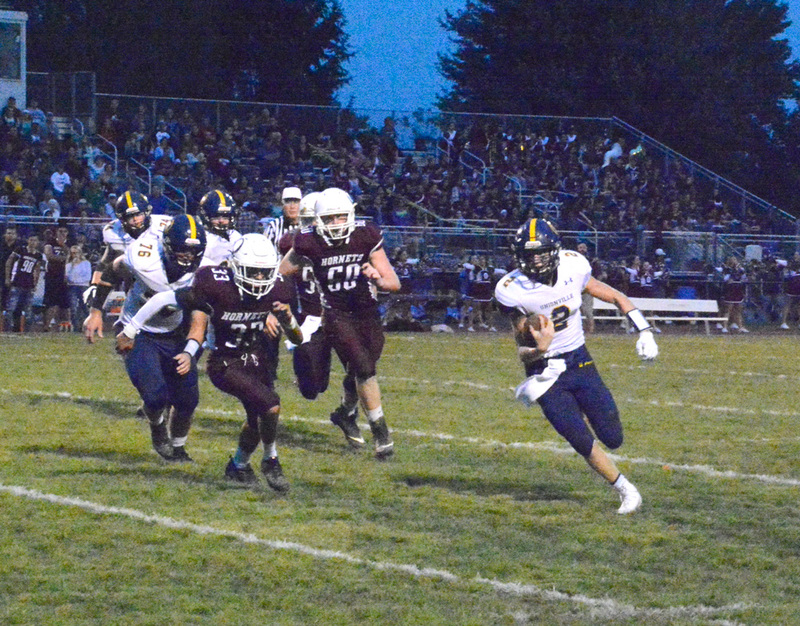 The Indians put down any idea of an Oxford comeback by mounting a long drive, powered by the running of Schilling, and seniors Nick Schnaars and Joe Fariello — with Schnaars’ slicing through the middle for a 15-yard TD run with 3:31 to go in the third. Schilling, running out of a “Wildcat” formation, scored a two-point conversion to make it 35-6. As the game wore on, both teams began blending in backups and junior varsity players, leading to a final quarter flurry of scores. 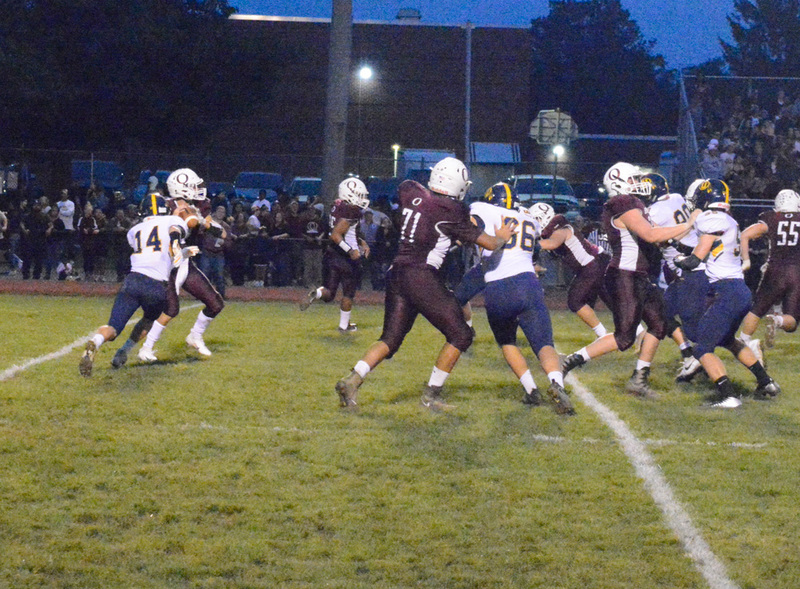 Weston Grim scored from 4 yards out, and after a blocked kick, Unionville led 41-6. Oxford’s backups immediately responded, with backup QB Drew Prangley hitting McWilliams for a 51-yard TD pass. A two point run attempt failed, leaving the score 41-12. Ethan Bennick scored a final Unionville TD, powering in from the 7. With Braithwaite’s extra point, the Indians went up 48-12. The Hornets will look to get things back on track in a Ches Month American contest next week against an improved Sun Valley, while Unionville hosts a rugged Haverford team next week in a non-league matchup.